We all want new and exciting electronic gizmos and gadgets for the holiday season. Unfortunately they have the tendency to lose almost all their value within weeks because of newer versions etc… but what if you just got a lump of dirty old coal in your stocking, how would you feel? The only individuals who would appreciate a dirty gift like that would be those forward looking investors who see major opportunities before they become the next big movers and headline news. 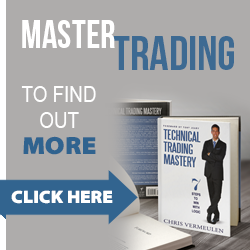 Knowing how to spot Stage 1 patterns is one of the most important bits of information you need to know as an investor. 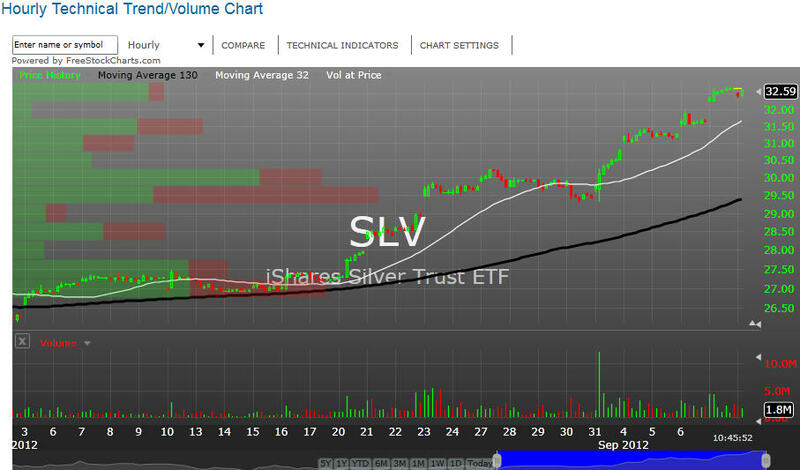 This one pattern is how I found RIMM which now up 100% in the past 30 days, ANR up 30% in two weeks, FSLR up 20% in 20 days and the list goes one. My main focus is on ETFs because of lower risk they provide but very powerful when applied to individual stocks. 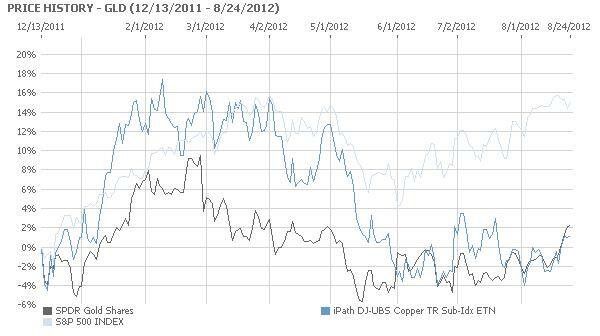 Coal and coal stocks have been out of favor for almost two years now. 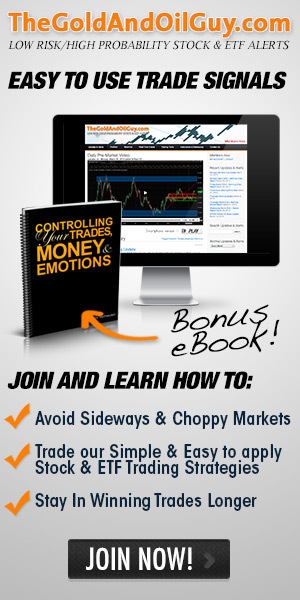 But these unwanted and hated shares may soon be owned by the masses, or at least by traders and investors. A few weeks ago to I talked about the four stages all investments go through and which patters you must be able to spot in order to make huge money investing while having very limited downside risk. In summary, Trade with the BIG BOARD and only focusing on buying stocks, ETFs etc… as they are coming out of a Stage 1 Accumulation Basing Pattern. This puts the odds greatly in your favor for not only winning the majority of your trades but to generate above average returns. The New York Stock Exchange is the big board. 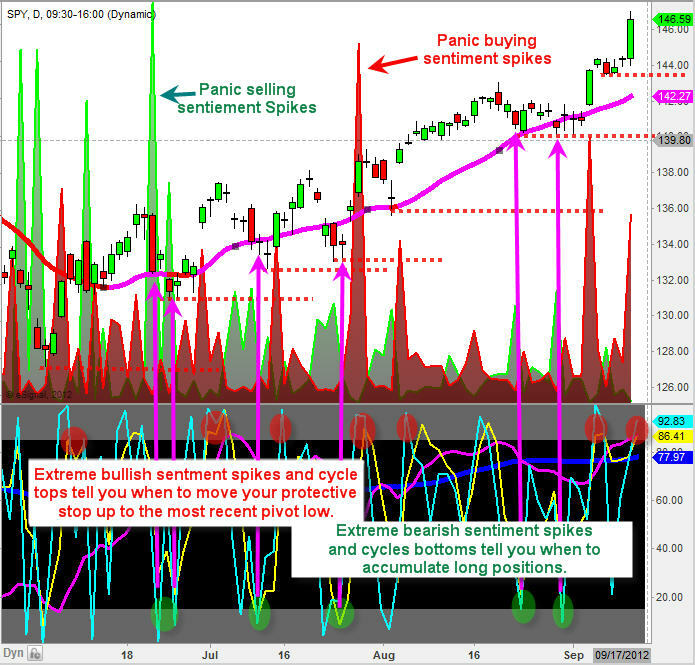 This chart formed a reversal candle last week which points to lower prices. Its likely we see a 1-2 week dip before buyers step back in. Until then individual stocks should pause or form mini bull flags until the sellers are finished and buyers step back into risk on assets (equities). 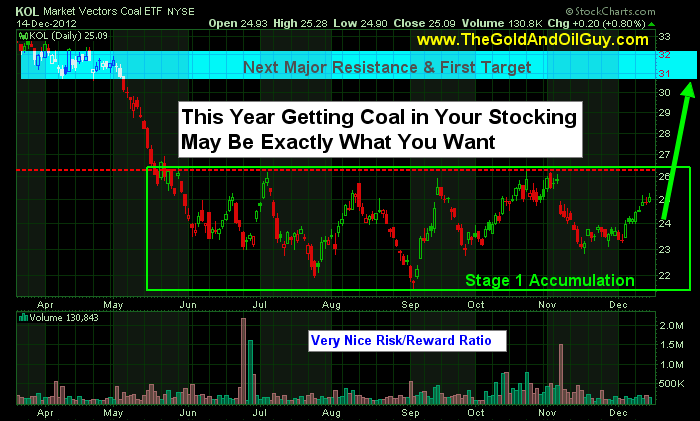 Coal stocks have been bouncing bottom for some time and if you did not review the Stages Report using the link above then do so now so you know what to expect in detail. KOL coal exchange traded fund is a basket of coal companies and is starting to show signs of a new bull market. 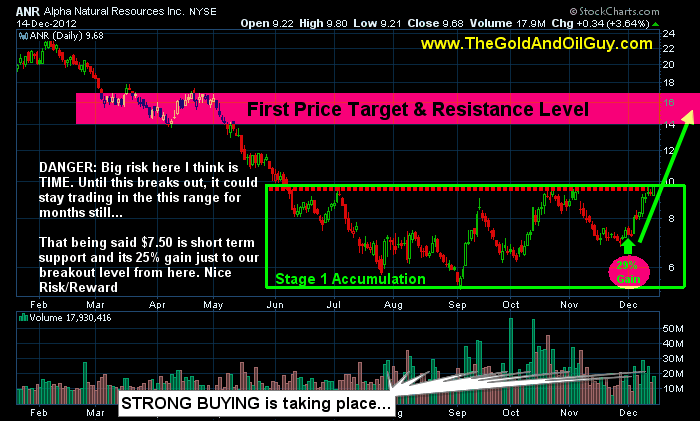 A breakout and close above $26.00 should trigger strong buying with the potential of a 21% gain before it hits my first price target. This could go way past that but one target at a time folks. Naturally I would like to see a bull flag or pause in KOL over the next couple weeks, then look to get long using the pivot low of that pause/bull flag as my protective stop. I’m not jumping in here as the broad market looks ready to correct and ¾ stocks follow the big board which will pull KOL down. You want Gizmos or Coal in You’re Stocking??? In short, I really like the coal sector for the first quarter of 2013. I’m not too worried about the fiscal cliff as it’s not the end of the world and the US along with most other countries are all bankrupt together in my opinion. New rules and ideas will be implemented and life and business will continue… I am not to worried. 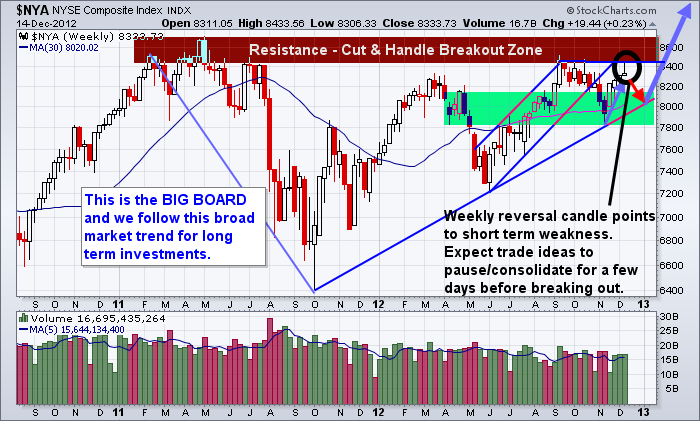 I am expecting stocks to continue sideways or higher into May at which time a serious correction could take place. But not to worry as we take things one week at time and will be adjusting my outlook accordingly. However, gold bugs holding gold bullion or even those holding gold ETFs such as the SPDR Gold Shares (NYSE: GLD) shouldn’t hold their breath in anticipation of the gold standard returning. There was a similar commission – the Gold Commission – set up in 1981 by President Ronald Reagan. After a lot of ‘commissioning’, the decision was made to go with the status quo of using fiat Federal Reserve dollars. Any commission set up under the current president would likely come to the same conclusion. There are simply too many practical obstacles to return to a full-fledged gold standard. Even pro-gold advocates including the World Gold Council and the Gold Anti-Trust Action Committee (GATA) don’t see a gold standard returning. The key problem would be at what price of gold would the United States peg its currency. Great Britain returned to the gold standard in 1925, after going off it in 1914, at the 1914 peg price. This was a mistake made by Winston Churchill (he called it the biggest he ever made) since it basically ignored the vast inflation in the British pound in those intervening years. The result was a vast overvaluation of the pound and deflation and high unemployment soon followed. But that does not mean there will not be a ‘back-door’ gold standard. The move to such as a system is already underway as central banks all over the world are rebuilding their stockpiles of gold. 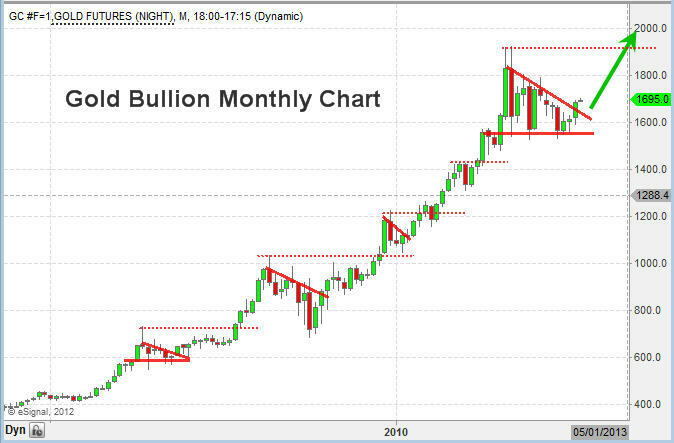 After two decades of heavy selling, central banks became net buyers of gold in 2010 and the momentum has built since. Gold will likely end up being used as ‘good’ collateral by global central banks, as opposed to the shaky collateral sovereign bonds are turning into. Central bank purchases, led by the emerging markets, are on track this year to hit a record high according to the World Gold Council. 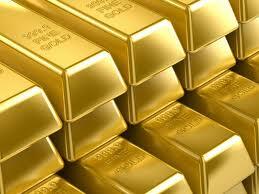 China alone in 2011 bought around 490 tons of gold. Other countries including Russia, Turkey and South Korea have added gold to their official holdings in recent months. This buying showed up as central bank purchases in the second quarter of 2012 were more than double the level reported a year earlier at 157.5 metric tons. If the buying continues at current levels, central banks gold purchases would total around 500 tons this year, easily surpassing last year’s 458 tons. The bottom line for investors from the global central banks’ buying of gold? The gold standard is working its way back into the international monetary system through the back door. 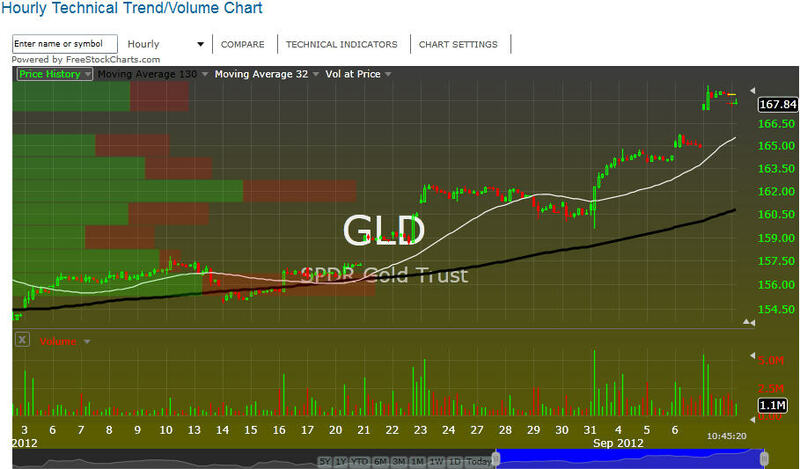 This should, in the long-term, put a floor under gold and help maintain it on its steady upward path.